Yoshokai Aikido is a traditional study of Budo, a Japanese art based on the philosophy, lifestyle and training of the ancient samurai warrior. The word Aikido can be loosely translated as "the way of Harmony". Aikido is a way of studying harmony through the use of physical movements. While training is often athletic and energetic, it is strictly non-competitive. There is no sparring or tournament; Aikido students instead train to improve themselves and their relationship with the world around them. 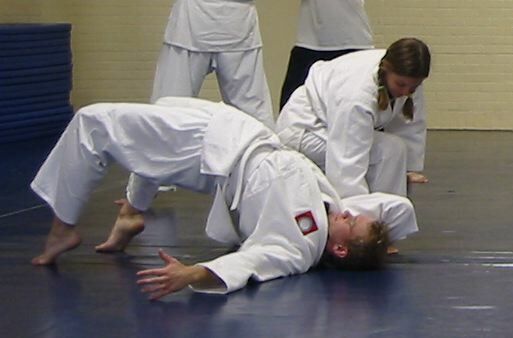 Although not combative, Aikido is based on the Samurai fighting arts, and incorporates powerful throws, pins, and traditional weapons techniques. In order to more fully understand and study the techniques, students study both the performing and receiving aspects of techniques, without emphasis on a "winning" or "losing" side. The Aikido Yoshokai Association of North America (AYANA) is under the instruction of Sensei Takashi Kushida an 8th Dan (8th degree black belt) from Japan who has been teaching Aikido in the Unites States for 30 years. AYANA's national headquarters is located at the Genyokan Dojo in Ann Arbor, MI and we have nearly 1000 members nation wide. UM Aikido classes meet Tuesday, Thursday and Friday from 5-6PM in the Intramural Sports Building at the corner of Hoover and State during the fall and winter semesters (classes do not meet May through August). Please wear loose comfortable clothing, preferably with long sleeves and long pants. You may attend an introductory class any time with no obligation or cost. If you choose to train with us class dues are $80 per term. Our head instructor is Akira Kushida-sensei, 7th dan and Senior Instructor of the Aikido Yoshokai Association of North America (AYANA). Classes are also taught by 6th Dan Larry Peck, 4th Dan Karen Clark, and 2nd Dan Steven Van Hise. For more information, please contact aikidoinfo@umich.edu.